At a time when traffic deaths have gone up, a recent study—self-described as the largest ever done on distracted driving habits—reveals that people taking their eyes off the road is a more pervasive problem than many may believe. Americans use their cell phones on 88 percent of the trips they take. American drivers, on average, used their phones for 3.5 minutes per hour on those trips. Drivers are 20 times more likely to be involved in a motor vehicle crash if they take their eyes off the road for even two seconds. But that's not all: When researchers adjusted the data, they concluded that there are nearly 60 million trips taken on U.S. roadways every day during which drivers are distracted. The ZenDrive piece also found that there was some correlation between safe-driving laws and the prevalence of distracted driving—at least on the state level. Among the 10 states with the least amount of distracted driving, six had laws that prohibited cell phone use while driving. While Pennsylvania was in the middle of the pack—it appeared as number 33 on the list—one city in the Keystone State was ranked among those with the highest level of distracted driving. In fact, Philadelphia was listed as number four, behind Los Angeles, Austin and Miami. Chicago rounded out the top five. We thought the timing of the study's release gave the car accident injury attorneys here an opportunity to repeat some of the best advice they have about the importance of keeping your focus on the road—after all, it is Distracted Driving Awareness Month. 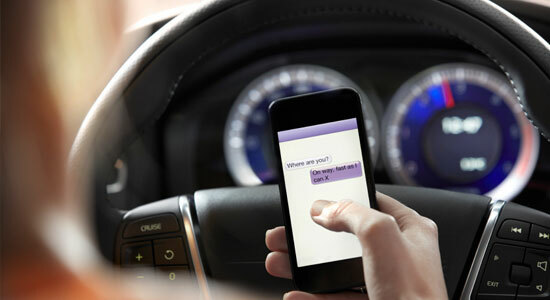 Understand what it means to drive distracted. It's not just texting. If you're driving while you're applying makeup, eating, or fiddling with your radio, you're distracted. Help technology help you. Check your cell phone provider and app store—there are many programs that will put your phone in driver mode when you're in your vehicle. If you're not familiar with these types of applications, we have resources on our website to help you better understand them. Put. The. Phone. Away. In fact, put it in your briefcase, your purse or your glove box—somewhere you won't be tempted to check the screen, or be distracted if you hear the tell-tale ding that alerts you to a text, missed call, or social media message. Unfortunately, we understand all too well what happens when people don't heed that safe-driving advice. Our car accident injury attorneys have said it before, and it's worth repeating here: Accidents DON'T just happen. They happen when careless people make irresponsible decisions. We hope you're never injured in a motor vehicle crash caused by a distracted driver, but if you are, please know that our experienced car accident injury attorneys are here to help. Call us today for a free case review. We're available 24/7, there's never an obligation to use our services, and there's never a fee unless we get money for you.